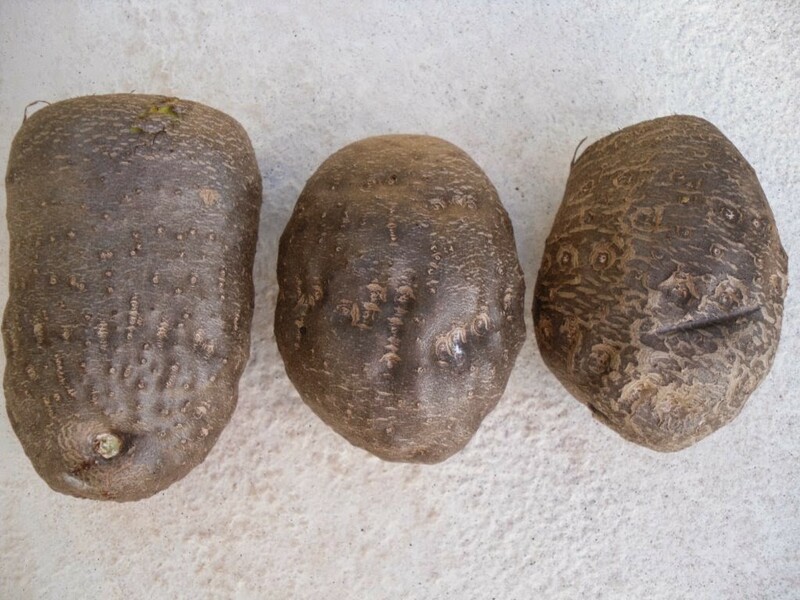 I get asked regularly about “edible air potatoes” since I’ve mentioned finding and eating them – so here is my edible air potato ID, in photos! The edible air potato, or “winged yam,” does grow wild here and there in patches across Florida. Both the hanging “air potatoes” and the roots beneath the ground are edible. The confusion over which ones are edible and which ones aren’t results from the fact that we have two main “air potatoes” growing wind in the state of Florida: one potential toxic and one that’s safe. This is where Latin names really come in handy. The edible type is called Dioscorea alata. NOTE: You can find these guys on ebay – including the rare purple version – if you can’t find them in the wild! So basically, if your bulbils are nice-looking, they’re probably the inedible type. You want dark, ugly things, not nice round asteroid-like bulbils. My wish-I’d-met-her unknown gardening gal Helen Parkey was growing D. alata. 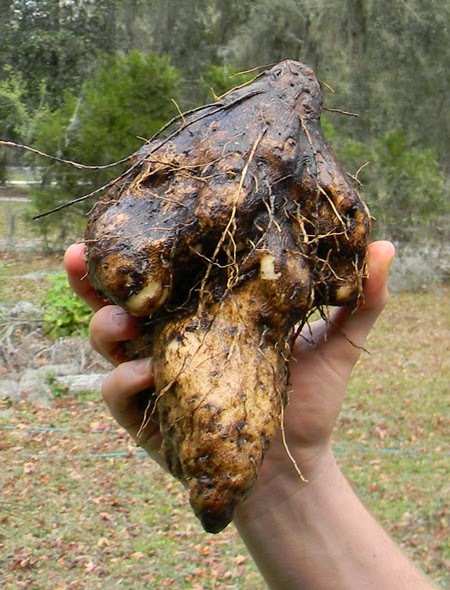 D. bulbifera doesn’t usually produce much in the way of underground tubers here in Florida… but D. alata can make awesome, delicious roots that are the perfect ingredient for the best hashbrowns and homefries ever. Rycamor and I found that yam growing beneath a large oak in a backyard. 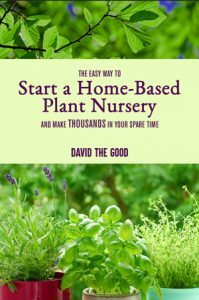 The edible air potato is propagated via cuttings and via planting the hanging bulbils in the fall. Overseas it’s a staple root crop. Here in the land of the free, however, this plant is on the invasive species list so it can’t be sold by nurseries… even though, somehow, ebay has it, as I mentioned earlier. Fortunately, Dioscorea alata can be found growing wild at this time of year and the bulbils are easy to identify. 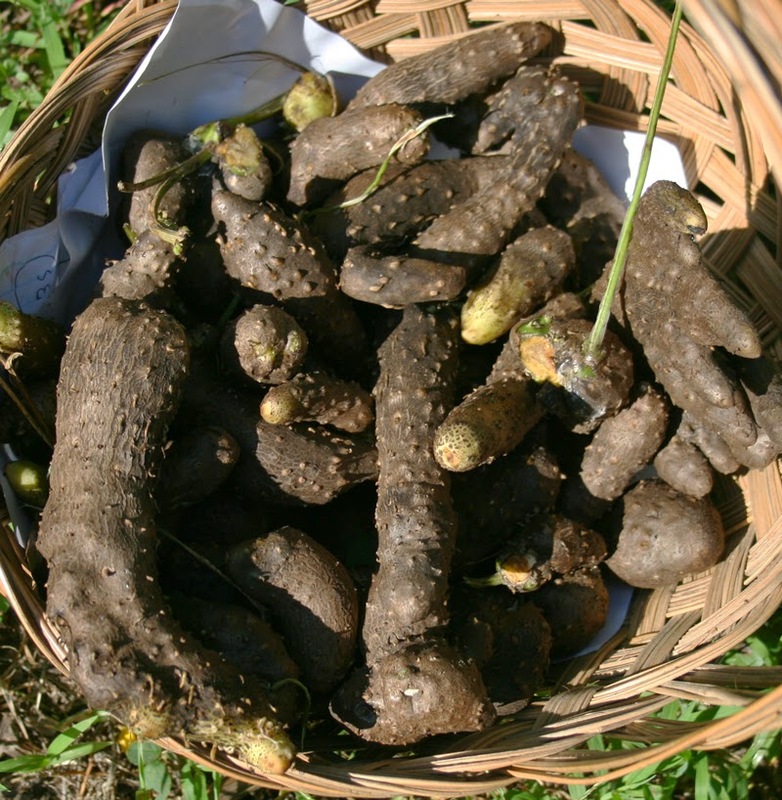 When you find an edible air potato growing in the wild, chase the vine down to the ground and start digging for free food – you’ll please your local chapter of the Florida Native Plant Society and your tastebuds at the same time. 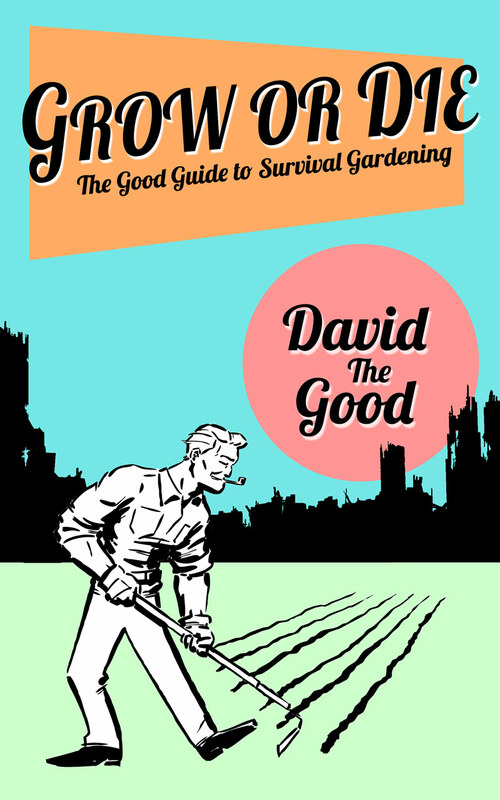 Shop at Amazon and support The Survival Gardener! "Land of the free"? But, you can't sell D. alata because it's an invasive food. Go figure. Maybe they'll change their minds when food prices are so high, people will need the "invasive" foods that grow wild : ) Enjoy yours! 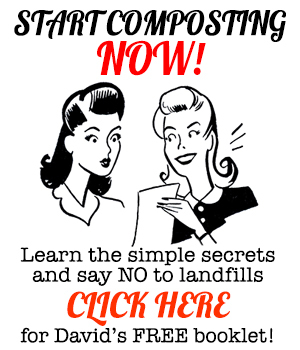 Corn and wheat are way more invasive and are responsible for the destruction of natural land and peoples health. I like the way you think, John. +1! When I google Dioscorea alata I keep pulling up a purple yam. Are the bulbils or root purple when you cut into them? Good question. Some varieties, yes. Generally cultivated types. However, there are also while, yellow and pinkish types, along with those that have a bit of purple in them. I have grown multiple different types. I’ve never found a purple one in the wild, though. wat about those with thorns inside? are they edible?